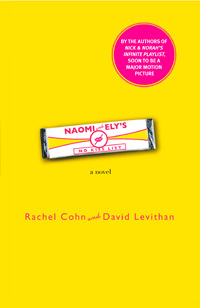 Written by the dynamic duo that wrote one of my favorite books, Nick and Norah’s Infinite Playlist, Naomi and Ely’s No Kiss List is pure genius. Even though best friends Naomi and Ely are college freshmen going to school in New York City, I related to them. Naomi is the beautiful, cool girl who doesn’t want to waste time with the wrong guys, and who I wish I could be more like. Ely lives to be the center of attention. I would love to get all that attention, but I don’t feel confident enough to actually do it. However, this isn’t just a story about two friends in college. Naomi secretly loves Ely but he’s gay. The title refers to a list of boys who neither of them can kiss since they both are attracted to them. This keeps them from ever betraying the other. And of course they can’t kiss the other’s boyfriend. So what happens? Ely ends up kissing Naomi’s boyfriend, Bruce the Second. To make matters worse, Bruce kissed Ely back! When Ely told Naomi about what he did, she acted like she didn’t care. But she was heartbroken; not because he kissed her boyfriend, but because she finally realized that Ely would never love her the way she loved him. After that, their friendship begins to crumble and it becomes a battle to hurt each other. Throughout the book, I was rooting for them to make up. Even though they don’t have an ideal relationship, they still love each other. I hoped that they would come to see that the love between best friends is powerful because they chose one another as best friends out of all the people they’ve met. This is an awesome novel that will make you laugh one second and cry the next. There’s also a great message—to stop believing in the concept of finding one true love but instead to believe in forming lasting relationships with everyone you love. 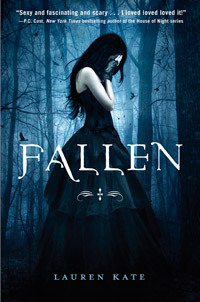 Normally I take one or two weeks to finish a book but it took me only three days to finish Fallen by Lauren Kate because I was so hooked. Fallen takes place in modern day Georgia, at a reform school named Sword & Cross. Seventeen year-old Luce Price is forced to go to Sword & Cross because her boyfriend died in a mysterious fire and the authorities suspected she killed him. Another reason is because she admitted that she can see what she calls “shadows,” which no one else can see. When Luce arrives at the reform school, she learns that there are fallen angels both good and bad hidden between the normal human students. At school, Luce meets two cute guys, Daniel and Cam. Cam buys her gifts and takes her on picnics, while Daniel flips her off the first time they make eye contact. He also accuses her of stalking him. Luce isn’t sure why, but she feels drawn to him and thinks she has seen him before—that’s why she can’t stop feeling attracted to him. One day, when she is at the library a fire starts and she loses consciousness. As she wakes up, she feels someone carrying her. When she looks up she sees Daniel, with big white wings on his back. When I read this I tried to figure out what this meant and if it was a dream or reality. I eagerly kept reading. Daniel tells Luce he is trying to stay away from her for her own safety. She slowly begins to learn the truth about the dangers of loving Daniel too much. Non-fallen angels in the otherworld will do anything to stop Daniel and Luce from being together. They send bad angels and demon-like creatures to try to kill her or take her away. I love how the author expresses the feelings of teenagers. I felt as if I was Luce when she sees Daniel in the library. “As she watched the slight movement of his body as he sketched, Luce’s insides felt like they were burning, like she’d swallowed something hot. She shouldn’t go to him. After all, she didn’t even know him, had never actually spoken to him. Their only communication so far had included one middle finger and a couple of dirty looks. Yet for some reason, it felt very important to her that she find out what was on that sketchpad.” Sometimes I feel as if I want to know what my crush is doing, even if I do seem like a stalker. I would recommend this book to anyone who loves fantasy and romance. I have also read the follow-up to this book, called Torment. I can’t wait until the next book, Passion, comes out. I really like Fallen because their love is put to the test against other creatures and even themselves when they doubt their love.